Do you like to see what attractions there are in an area you plan to visit? Do you feel obliged to trawl through websites to check season opening dates and times for attractions that you’d like to visit? Do you find the whole process time-consuming and frustrating? Would you like one place where dates and times and clickable links through to the attraction websites are all available in one easy to use place? 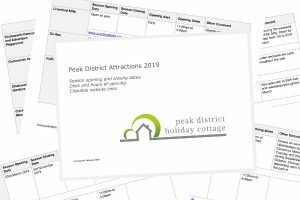 Sign up to our Peak District newsletter and download our FREE and easy to use 2019 guide to the main attractions. Our newsletters are full of Peak District news, ideas for things to do and great photography. Our subscribers will be the first (and quite often the only ones) to hear of special offers that we are running so we hope that you will enjoy receiving our emails.